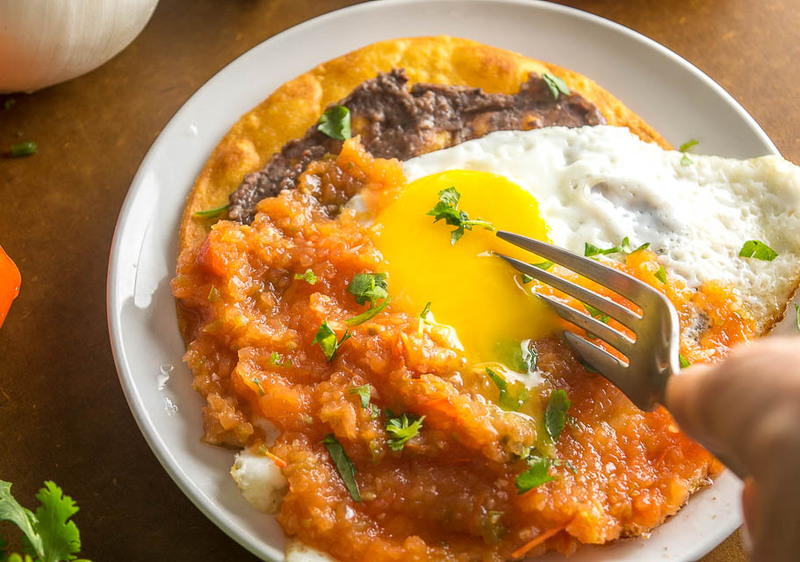 This is probably the easiest way to make a killer batch of refried beans without spending a couple hours cooking the beans. 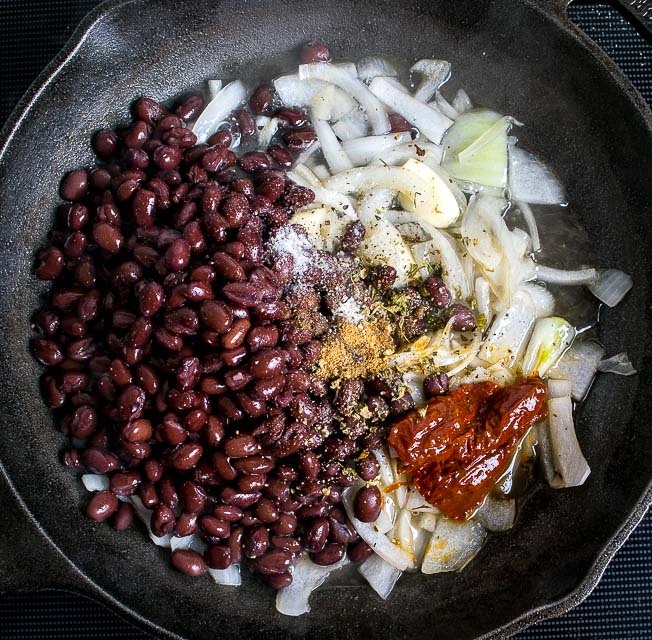 If you want to read about cooking up some beans from scratch see our Frijoles de Olla post. But this version starts with cooked beans — and you can get away with using a can of store-bought beans because you’re loading them up with authentic flavors. Pot beans get mashed up and cooked in some fat, most likely lard. Plus maybe a bit of seasoning. You really don’t need much more than that for a satisfying batch of frijoles refritos, but if you bypass the lard like we’re doing today then you gain quite a bit by adding in some additional flavors. And note that the accepted term “refried” can be a little misleading; you’ll only need to cook them off once to make an authentic batch. You can roughly chop the onion because all of this is going in the blender eventually. Similarly, I tend to just peel the garlic cloves and plop them in whole. The onion will need about 5-8 minutes to soften and that will give you plenty of time to gather the other ingredients. I usually drain and rinse the canned beans, so we’ll do that with a single can of black beans. 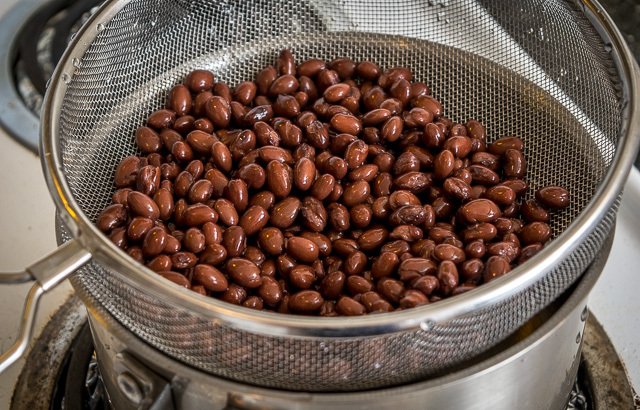 But keep in mind that you can use pinto beans and get an equally good batch. I’ve also used Peruano beans with a similar recipe and had good results. Peruanos are also known as Canary beans or Mexican yellow beans. Let this simmer for a few minutes until everything is at a uniform temp. For speed I usually just give this a whirl in the blender, but of course you are welcome to finely dice the ingredients and use a potato masher to mush up the beans directly in the pan. After blending, definitely give a taste for seasoning. 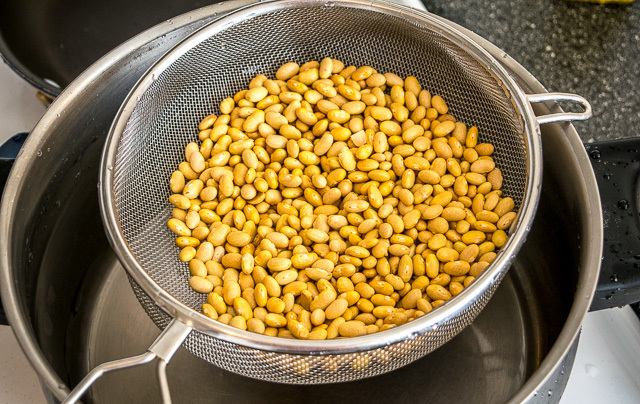 Beans are finicky when it comes to seasoning and having the proper level of salt will really make them come alive. You can also add a bit more heat if you want by adding another chipotle or some more adobo sauce. You can use these straight out of the blender, but if your blended batch comes out thinner than you want, simply put it back in the saute pan and cook over medium heat for a few minutes until they thicken up. If starting over with a dry pan I would probably add some oil to it first (or lard!). Similarly, if your batch is having trouble combining in the blender, simply add a splash of water until it combines well. 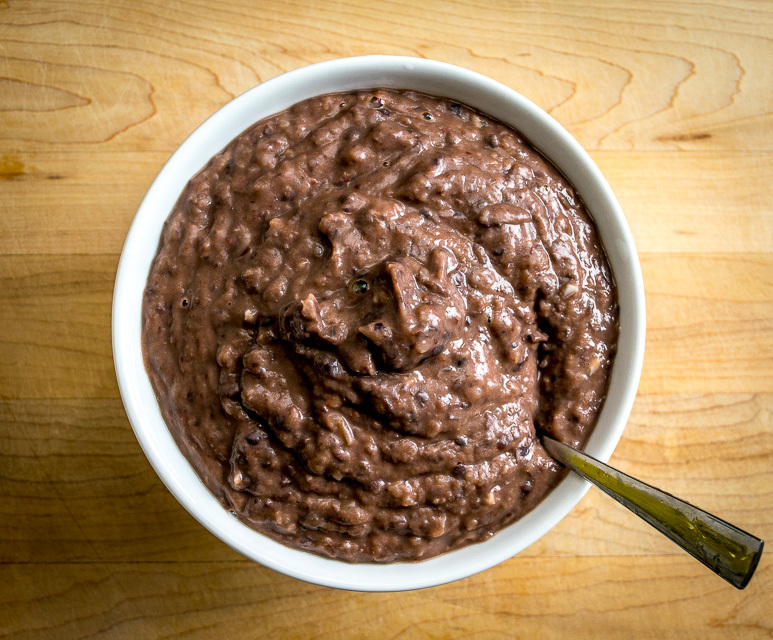 You’ll end with an addictive batch of refried beans that you can use to make all sorts of on-the-fly meals. Even beans and cheese heated up in a corn tortilla will be massively satisfying because the beans already have so much flavor. 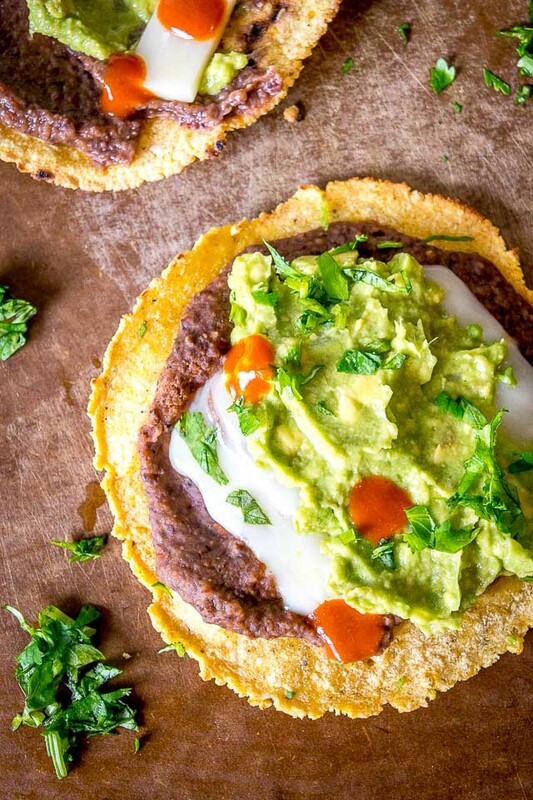 You can also add Guacamole to this combo as seen in our Black Bean and Guacamole Tostadas. But however you serve them up, they will deliver some real deal flavor and they are a great addition to your kitchen repertoire so please consider making a batch! Feel free to use the comments section below if you have any questions about them. 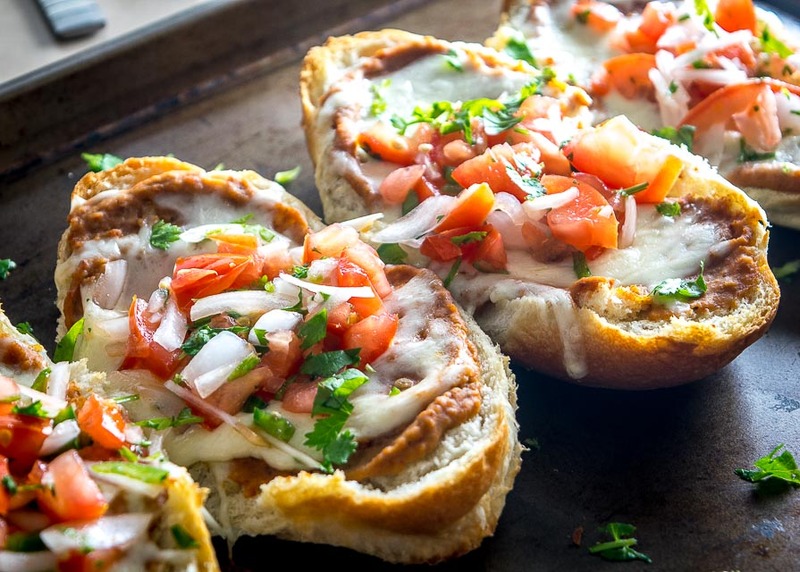 This is a great way to add authentic flavors to a homemade batch of refried beans. Start by peeling 2 garlic cloves and roughly chopping 1/2 onion. 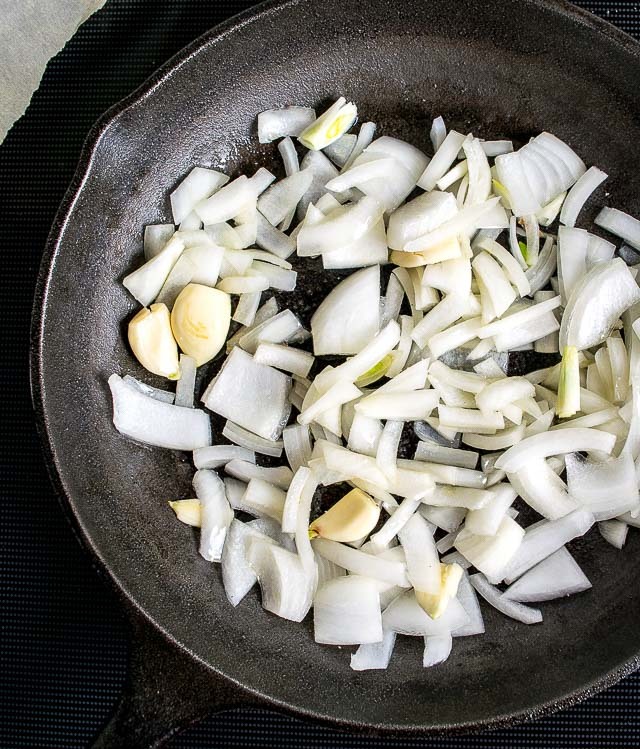 Cook the onion and garlic in a dollop of oil over medium heat (you can leave the garlic cloves whole). Once the onion is starting to brown, approximately 5-8 minutes, add 1 can beans (drained and rinsed), 2 chipotles in adobo, 1 tablespoon adobo sauce, 1/2 teaspoon cumin, 1/2 teaspoon salt, freshly cracked black pepper, and 1/2 cup stock (or water). Let simmer for a few minutes until heated through and then add everything to a blender, combining well. Take a final taste for seasoning and heat. Add more salt if necessary and if you want more heat you can add more chipotles (or adobo sauce). Serve as is or saute them in some oil (or lard!) over medium heat for a few minutes to thicken them up. You can always adjust the consistency of the beans by either adding water to thin them out, or if they are too thin you can saute them in some oil over medium heat for a few minutes to thicken them up. We just used these beans to make a batch of Huevos Rancheros. 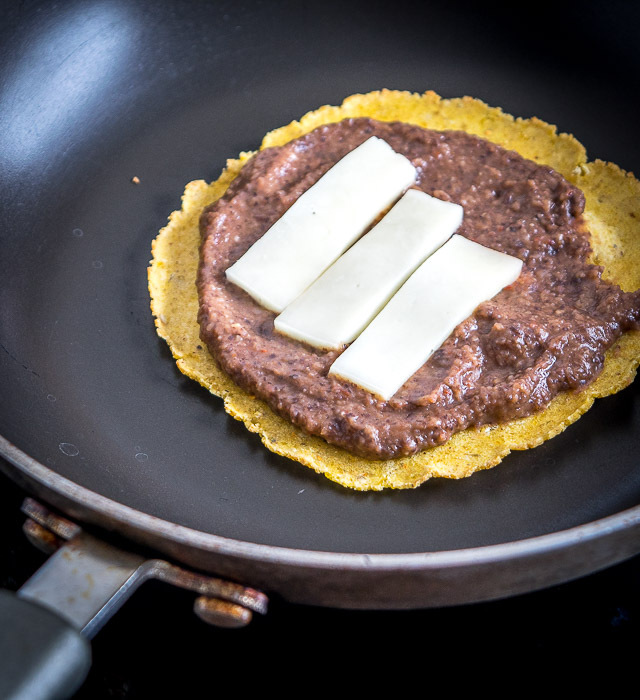 Hi, can these refried beans be frozen for use later? I’m sure they’re best fresh, but if I need some ready for week-night meals, does the flavor/consistency change once frozen? Thanks! Hi Christel! Although I’ve never tried freezing these exact refried beans I would think they would freeze quite well. I freeze whole, cooked beans all the time and they handle the big freeze without a hitch. You’re right, they will probably always taste best freshly made, but I bet you would still be happy with them after freezing. Cheers. Patrick.. our local temperatures have been in the 90’s almost kissing 100 degrees, the very LAST thing I want to do is cook. Then I feast my eyes on that sheet of nachos you’ve pictured above.. my resistance was holding until then. Now I’ll turn my kitchen into a sweat lodge, swelter with a smile and some Patrick’s recipes. Ha thanks John! It will be worth it as most peeps go bonkers over those Nachos. Feel free to simplify as all you really need is the beans-cheese-chips layer, everything else is just a bonus. Wow, made these yesterday and love them! Thanks so much for such a yummy – and healthy – treat. Thanks Sue, so glad you enjoyed them! Made these last night to go with the huevos rancheros. My teenage daughter said it was one of the best meals she ever ate lol! The chipotle and adobo really gives it a great flavor, very smoky. Only two issues, I had to use a lot more than half a cup of liquid to get the blender to mix them, then my Vitamix is so powerful it made them into a bean puree. Still tasted amazing, but I’ll probably use a potato masher next time to leave more texture to them. Thanks for your notes George, so glad your fam liked them! I’m wondering if I can use chipotle powder in place of the chipotle in adobo sauce? I’m so excited to have found your blog! I eat a no oil vegan diet, but there are some great recipes that I can tweak to work for me! Thank you! Hey Jodi! Yeah you can use chipotle powder for these beans but they won’t be as good! Chipotles have incredible flavor and if can track some down it will be worth it. You can get them quite easily online as well. I’m always telling people that the homemade salsas and sauces are the most important element in Mexican cuisine, and once you find a few of those that you like then you can easily adapt them to your diet. And don’t forget that there’s a Vegetarian Recipes tab if you ever want a headstart on some vegan ideas. I hope you find some keeper recipes! These are wonderful! I had over-cooked some adzuki beans and used them to make this recipe. Also, only had a red onion on hand, so used that. No more buying canned refried beans for me. These are the best! I eat a whole foods plant based way with no oil and very little salt and this was easy to adapt for my needs. Hola. Gracias a las recetas de frijoles refritos, salsa verde y el pico de gallo, mis nachos fueron una sensación!!! Los hice por primera vez el viernes y gustaron tanto que hoy tuve que prepararlos nuevamente. Definitivamente, estas adiciones hacen la diferencia. Y para rematar, agua de hibiscus, qué refrescante! Nadie pidió soda, lo cual era la idea. Me declaro fan absoluta de este blog. Recetas fáciles, rápidas y llenas de sabor. Muchas gracias. Gracias por sus comentarios Claudia!